Pro Day workouts by the likes of Johnny Manziel will do little to affect teams’ evaluations of players coming into the league from college. Words such as “phenomenal” and “special talent” were thrown around by media analysts last week after star defensive end and potential No. 1 overall draft pick Jadaveon Clowney participated in his 15-minute Pro Day workout in front of dozens of scouts on the University of South Carolina campus. 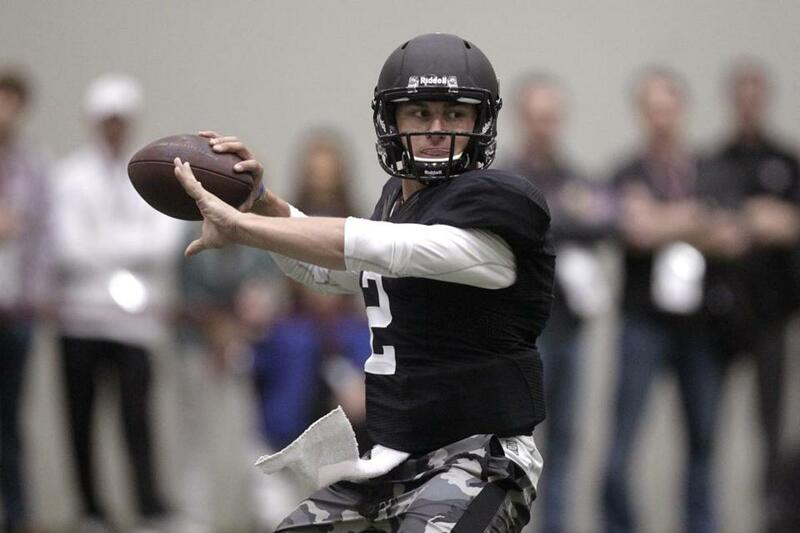 Heisman-winning quarterback Johnny Manziel, meanwhile, received reviews such as “impressive” and “dazzles” at his Pro Day two weeks ago at Texas A&M, supposedly vaulting himself into contention for the No. 1 pick, as well. Pro Days garner the NFL headlines in March and April, but the reality is these Pro Day workouts will mean very little to teams in their evaluation of the two prospects. Quarterback workouts, especially, are more sideshow than legitimate football event. The workout is run by the quarterback’s personal coach, the throws are scripted and practiced several times in advance, and the player isn’t throwing against a defense. Manziel’s workout included an appearance by former president George H.W. Bush and wife Barbara, a soundtrack by rapper Drake, and a personalized outfit that Nike put on sale immediately after the workout. Pro Days are often used as a final justification for drafting or not drafting a player, but often the scouts can watch a workout and come away with many, varied opinions. That’s not to say Pro Days don’t have any value. They are one of the few times coaches and scouts can get a close look and have personal interaction with prospects — NFL position coaches always run the Pro Day drills for every position other than quarterback. Pro Days are also a good way to check out players who were injured and did not participate at February’s combine, or to scout some of the lesser-known prospects that could help a team at the back of the draft. ■ Get to see the athletes perform skills they didn’t do in college, such as Clowney displaying drop-back coverage. ■ See what kind of condition the players are in, knowing that the NFL scouts are watching. ■ See how much the players have improved (or the opposite) since the combine, an indication of work habits. ■ See how they interact with coaches, scouts, and teammates, and in a competitive environment. Still, the Pro Day is only a tiny piece of the overall scouting equation. “At the end of the day, the tape and the fall grades are the most important grades,” the executive said. Pro Day workouts generally consist of combine testing — bench press, vertical jump, 40-yard dash — as well as agility drills specific to positions, and can last from 15 minutes to an hour. A good Pro Day is expected, given the controlled environment, and a mediocre one can set off red flags, particularly at quarterback. Louisville quarterback Teddy Bridgewater, also a candidate for the No. 1 pick, has many analysts rethinking their rankings after turning in a less-than-crisp Pro Day last month. Most teams, especially those that need a quarterback at the top of the draft, won’t panic over Bridgewater’s shaky day, but they will go back and watch his film more closely and reevaluate his draft grade. While Pro Days get all of the attention, it’s the private workouts afterward that really matter. Teams only have the ability to work out players on campus or in their hometowns, and the private workout is the team’s chance to test the players on the field and in the classroom in an unscripted environment. The Browns, picking No. 4 overall and widely believed to be in the quarterback market, haven’t even bothered attending any of the Pro Days of the top prospects. But they’re working each player individually and likely bringing them to Cleveland for visits with coaches and top personnel. Former defensive tackle Sean Gilbert had 42½ sacks in 11 NFL seasons, and now he’s aiming to take down Players Association executive director DeMaurice Smith with some pretty eye-opening numbers, if they are to be trusted. Gilbert, a vocal opponent of the job Smith did in negotiating the 2011 collective bargaining agreement, which runs through 2020, is preparing to challenge Smith for his job when a vote is held in 2015. Gilbert met with several agents at the combine to recruit the support of their players, and last week circulated an e-mail to the agents outlining his problems with the CBA and his steps to fix it. “1. Under Gene Upshaw, the salary cap would have been $157 million this year instead of $133 million. That is a shift of $768 million from players to owners THIS YEAR ALONE. For background purposes, the league’s salary cap was expected to be $135 million in 2010 before the owners opted out of the previous CBA. They had an uncapped season in 2010 and then reset the salary cap at $120 million for 2011. The cap remained relatively flat for three seasons before jumping to $133 million for the 2014 season, and could jump as high as $160 million for the 2016 season based on the spike in TV revenues. Gilbert, a close personal adviser for Patriots cornerback Darrelle Revis who helped him stage a successful contract holdout in 2010, said he is “in the process of drafting a platform” for his candidacy for the NFLPA top job. The platform seems to be centered around two ideas — that the players can terminate the CBA because of collusion, and a new concept called the “Contract Dissolution Benefit,” which he didn’t explain. Gilbert made clear that he isn’t advocating a player strike. Gilbert likely will have an uphill battle proving any owner collusion in court, and Smith appears to still have good support among players. Bill Belichick left his imprint by popularizing the 3-4 defense with Lawrence Taylor and the Giants and is starting to leave his imprint on the league’s bylaws by suggesting several rules changes at the owners’ meetings last month. Not surprisingly, Belichick also is responsible for a popular scouting trick teams use on quarterback prospects — or at least so he claims. In the new movie “Draft Day,” in which Kevin Costner wheels and deals as general manager of the Browns, one of the methods the Browns used to judge quarterbacks was to give each a playbook and tape a $100 bill to the last page. The quarterbacks were then asked to send the playbooks back, and if the $100 bill was still there, the team knew the prospect didn’t read the entire playbook or had lied about doing so. Ivan Reitman, the movie’s director, appeared on comedian Dennis Miller’s syndicated radio show last week and spoke about how that detail was added to the flick. The Ravens have had a fairly productive offseason, re-signing almost all of their key players in Terrell Suggs, Dennis Pitta, Eugene Monroe, and Daryl Smith, and adding Owen Daniels and Steve Smith in free agency. And they’re only a little more than a year removed from winning the Super Bowl. But even coach John Harbaugh acknowledged that the Ravens’ moves pale in comparison to those made by the Patriots and Broncos, who loaded up with players such as Darrelle Revis, Aqib Talib, DeMarcus Ware, Brandon Browner, Julian Edelman, and T.J. Ward. Quarterbacks — Josh Freeman, Matt Flynn, Rex Grossman. Running backs — Johnson, Michael Bush, Bernard Scott. Fullbacks — Le’Ron McClain, Greg Jones, Vonta Leach. Wide receivers — Santonio Holmes, Sidney Rice, Miles Austin, Danario Alexander. Tight ends — Jermichael Finley, Dustin Keller, Ed Dickson, Tony Scheffler. Defensive ends — Anthony Spencer, Will Smith. Defensive backs — Champ Bailey, Asante Samuel, Jabari Greer, Steve Gregory, Thomas DeCoud. Speaking of players without a team, one interesting situation to watch is that of Eric Winston, an eight-year veteran who spent last year with Arizona. Winston, 30, was recently elected president of the NFLPA, succeeding Domonique Foxworth. Neither of the last two presidents were able to find spots with teams after being elected — Foxworth was elected in 2012 and last played in 2011, while Kevin Mawae was forced into retirement after being elected in 2010. Perhaps Winston’s unemployment is because of shaky play – ProFootballFocus.com rated him as the 69th-best offensive tackle out of 74 last season — but Mawae openly questioned if he was being blackballed, and it’s fair to wonder if the same could happen to Winston. Seahawks coach Pete Carroll, who signed a three-year contract extension through 2016 on Friday, joined Jimmy Johnson and Barry Switzer as the only coaches to win championships in college and professional football. Carroll was asked at the owners’ meetings to explain the difference between the two championships (Carroll won the BCS title for the 2004 season with USC). The Patriots have been known to play hardball in contract negotiations, but one player they should lock up to a long-term deal sooner rather than later is free safety Devin McCourty. Football and cap-wise, it makes a lot of sense. McCourty, entering his fifth season, developed into one of the league’s best free safeties last year, and a contract extension could lower his $5.115 million cap number for the final year of his rookie deal. But more importantly, McCourty has been an exemplary representative of the Patriots, and with the organization sensitive to off-field issues following the murder charge of Aaron Hernandez, McCourty is just the type of player the team should want to keep. In two-plus months this offseason, McCourty held a casino night to raise funds and awareness for sickle cell research, appeared at an elementary school two weeks ago, appeared at Boston Children’s Hospital last Monday to shoot a video about sickle cell, and on Wednesday helped launch a food drive to help needy families receive milk.